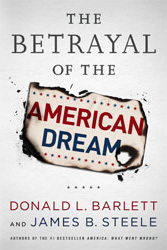 For the last three decades, policymakers in Washington and business leaders on Wall Street have betrayed the promise of the American dream—the belief that the United States, anyone who is willing to work hard has a fair chance to succeed. This concept is as important to the history of this country as the Bill of Rights, and in the twentieth century it inspired a large middle class of workers who had every reason to believe that their future was secure and that their children might become even more successful. Today nearly everyone recognizes that America’s middle class is in crisis, and this book tells why: Since 1980, a series of policies and business strategies specifically crafted to enrich a wealthy few at the expense of everyone else have made it possible to systematically shift the burden of taxes to the middle class, send hundreds of thousands of jobs overseas and eliminate more than 85,000 pension plans. The wealth gap between average workers and the elite one percent has never been greater, and it’s growing. This disparity is no accident: It’s the direct result of a systematic assault on the middle class in the form of tax policies, trade policies, and banking policies. Whether these policies can be reversed will determine the future of this democracy. The late Supreme Court Justice Louis Brandeis once defined the choice which the country now faces in this way: "We can have concentrated wealth in the hands of a few or we can have democracy. But we cannot have both."